My crafts are my meditaion. I 'm feeling ill for couple of days, tired and nervous. Trying to take care of my self and girls. Chamomile tea with honey helps me to soothe my throat but only my crotchet hook helps me to relax. I like crotchet more then knitting because I feel I can sculpt anything with my crothet hook and not only making rows with knitting needles. This time I've decided to make a healing fairy. I used Rosemary leaves from my garden in the filling for healing and Sugar Cane yarn for her colorful hair. The wings were the hard part in her making. 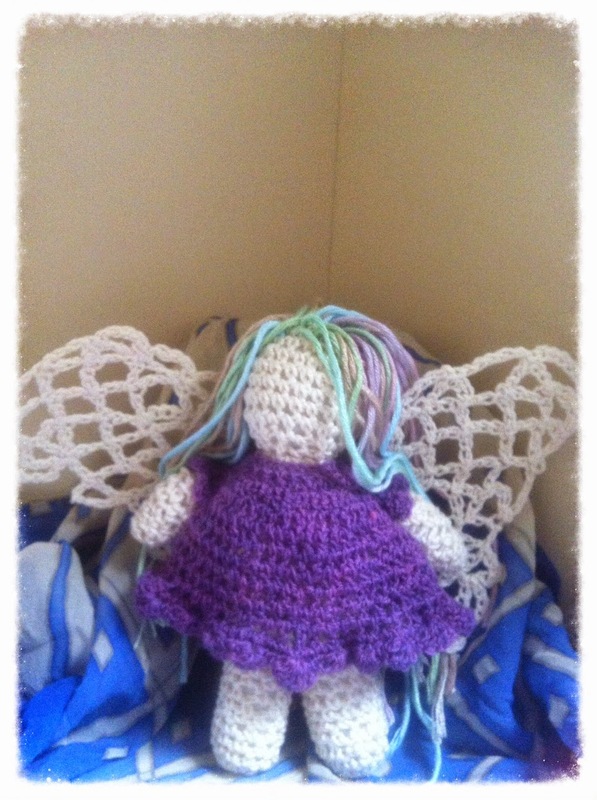 I've tried 5 times to crochet her wings but it wasn't right as I wanted them. I made them purple, green and even mixed different yarns together but still it wasn't right. So I've decided to make them white with cotton yarn as her body. My emotional state is the major part of all my crafts and it took me couple of days to understand how to make these wings. The wings look slightly different. One wing is for healing the past and the other one is for healing the future. I stiffen the wings with cornstarch and she is ready! I called her Rose-Marie because of the rosemary herb I used in her making. When my daughter saw her, she asked me to make one for her as well but with red hair and red dress. So another fairy is on the way. May this fairy bring healing to my family.